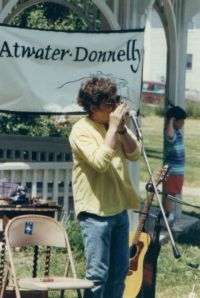 Following are some photos of Aubrey Atwater and Elwood Donnelly at various concerts, festivals, and photo-shoots. Click on any photo for a larger view. We are pleased to make these photos available for use by venues on their web sites and advertising materials. These photos have been compressed for quick loading by our web site visitors and, while suitable for use on web sites, they will not reproduce well on hard copy. Please visit our Press Room for high-resolution photos. 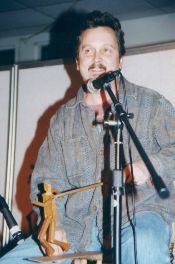 Martin Zak, old time musician and dancer from the Czech Republic. 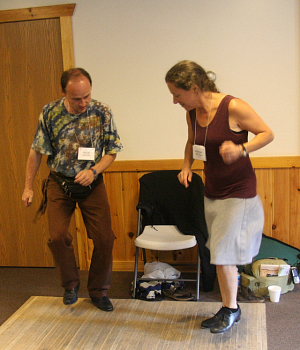 Aubrey and Elwood at the 2007 Rhode Island Folk Festival. 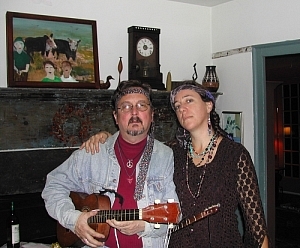 favorite folksingers on Halloween 2005. 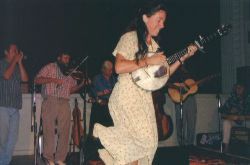 All photos and movie clips taken by Ellen Smith Pratt, the great Folktown "roadie." 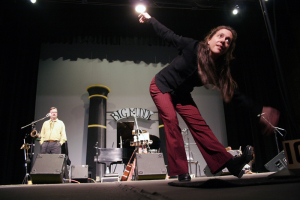 Here are a few photos and movie clips of rehearsals and performances of FOLKTOWN, one of the best projects Aubrey and Elwood feel they have ever done! 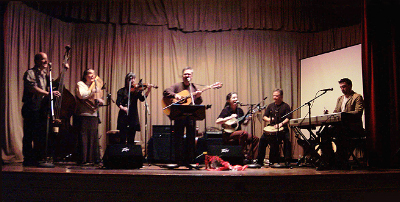 Folktown is an original play, written by Bob Hollis, based on 22 songs in the Atwater~Donnelly repertoire. Approximately 100 people from Foster and neighboring towns were involved to create a powerful and exhuberant community experience. 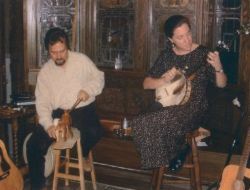 All six performances were to full houses and sell-out crowds. Read the original Press Release for more information. Enjoy! In the dressing room ... Amy Hollis played the Fifth Mary, the heroine of the play. Muses Aubrey and Elwood sing in "Museland" at one of the dress rehearsals. 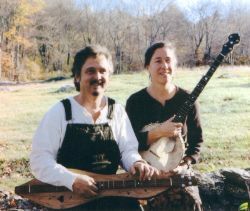 The Folktown DVD: if you'd like to order a copy of the Folktown DVD and make a small donation to Swampmeadow Theatre, please get in touch with Bob Hollis or Carol Mauro at Swampmeadow@aol.com or 401-397-4740. Rehearsing "The Devil and the Farmer's Wife" with the children. Act 1, Scene 3c: "The Golden Glove" with many members of the Folktown cast in the first of several wedding scenes. Act 1, Scene 6b: Aubrey and Elwood sing "Johnny Be Fair." 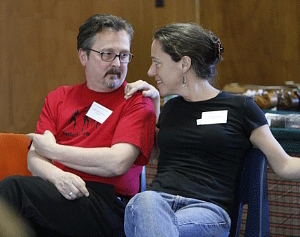 Actors include Heather Christie, Katherine E. Kent, Burr Harrison, and Liam Dailey. Act 2, Scene 4a: "Shule Aroon" (Johnny Has Gone For a Soldier). Mary Synko (Amy Hollis) gives Rachel (Mariah Harrington) hope. Act 2, Scene 5b: "I Wonder When I Shall Be Married" with actors Amy Hollis, Lauren Curley, Lona Robillard, and Artie Robillard. 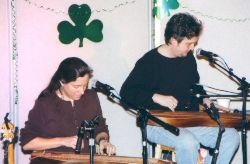 Aubrey and Elwood perform at the "Cocoahouse" at The Children's Studio. 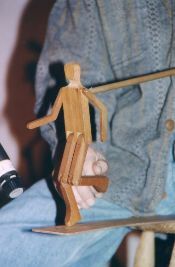 A child examines Elwood's limberjacks before the cocoahouse performance. 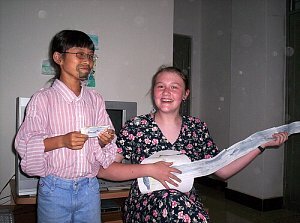 Halloween 2004, Elwood and Aubrey dress up as folksingers. 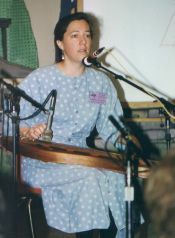 Photo courtesy of Mary Akylas Harman. 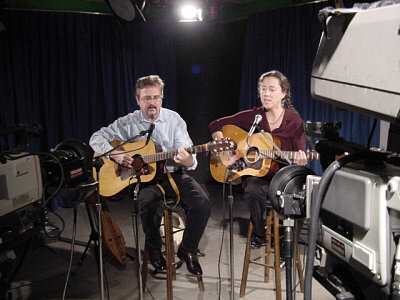 Aubrey and Elwood recording a show for Mansfield (MA) Cable Television. Photo courtesy of Mac McLanahan. Elwood and Aubrey in the main stage performance. 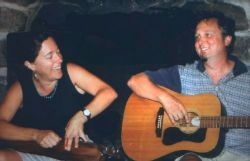 Photos courtesy of Susie Kraeszig. 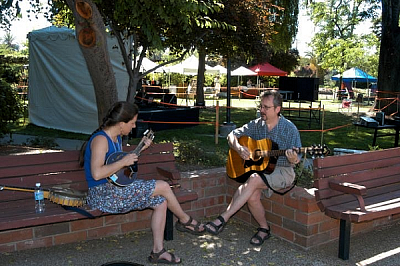 at the Claremont Folk Festival, Claremont, CA, May 2004. It was 100 degrees during their performance! Elwood at a music party at home in R.I.
at Gaspee Days in Warwick, RI. 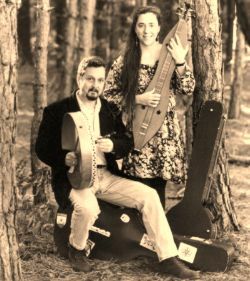 Aubrey and Elwood at "August Dulcimer Daze" in Wilmington, VT, August 2000. At their farm in Foster, RI. Music Fest" in Albany, NY. 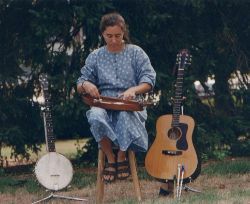 in Wilmington, VT, August 2001. 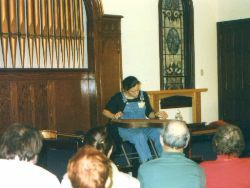 Aubrey at the Ozark Folk Center's Mountain Dulcimer Jamboree, April 2001. 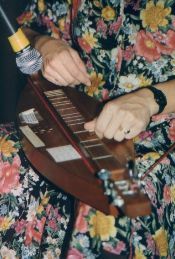 Close up of Aubrey playing the dulcimer at a coffeehouse in Lexington, MA. At the Armagh Coffeehouse in Bedford, MA. 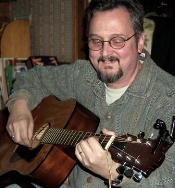 At a house concert in Rockford, IL. Photo shoot near near the reservoir in Scituate, RI. 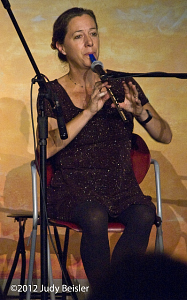 Photo by Berge Ara Zobian.